Here is another internationally known sports car which recently acquired a string of rally successes to its credit. 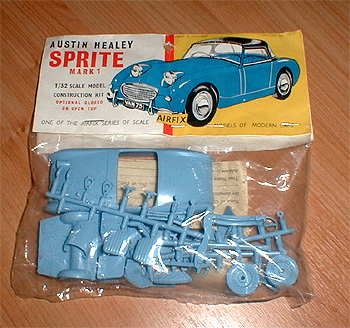 This 4 1/4 inch Airfix model is constructed from 52 parts and can be completed as an open sports car or hard-top. Interior features include bucket seats, windscreen, steering wheel, dash-board, gear lever and transmission cowling. Chassis details show independent front suspension and rear springs with transmission.